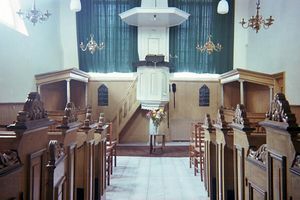 Interior of the Doopsgezinde Kerk, Hindeloopen. The Waterlander congregation is said to have numbered 1,000 members in 1653. In this year a new meetinghouse was built, being then the largest one in Friesland. Soon after, a division in the congregation took place, the smaller group being a Waterlander congregation, numbering nearly 200 members, around 1700, and meeting in the Kleine Huys; the other group, more conservative and calling itself Flemish, meeting in the Groote Huys, numbering about 600 members at that time. Through the intercession of the Friesche Doopsgezinde Sociëteit (Mennonite Conference of Friesland) the groups united ca. 1740, but in 1749 a new schism occurred, which lasted until 1810. In this year a part of the Kleine Huys joined the Groote Huys congregation, while other members of the Kleine Huys turned to the Reformed Church. In the meantime the membership had greatly decreased as a result of the decline in trade and population. The membership of the two congregations combined was about 780 in 1700; decreased to about 200 in 1796 and to only 57 in 1838. Since then the membership remained small—43 in 1861, 48 in 1900, 70 in 1929, 57 in 1954. In 1808-1817 and 1834-1873 the pastor of Hindeloopen also served Molkwerum; in 1870-1949 its pastor served also at Koudum; since 1942 the congregations of Hindeloopen and Staveren have had the same pastor, mostly living in Staveren. In the first half of the twentieth century Hindeloopen was served by the following pastors: F. J. de Holl 1900-1903, G. A. Hulshoff 1904-1910, A. de Jong 1910-1914, R. Swart 1916-1919, B. P. de Vries 1920-1923, H. Bussemaker 1926, A. L. Broer 1926-1929, Miss J. H. van der Slooten 1932-1939, Miss S. E. Treffers (of Staveren) 1942-1946, L. Laurense (of Staveren) 1949-1953, vacant after 1953. Activities are a Sunday school for children since 1917, a ladies' circle since 1927. 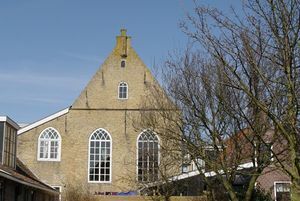 The last service in Hindeloopen was held on 30 December 2003. Services continued at Workum. Doopsgezinde Bijdragen (1861): 122, 136; (1870): 34-37; (1874): 87; (1903): 91. Hege, Christian and Christian Neff. Mennonitisches Lexikon. Frankfurt & Weierhof: Hege; Karlsruhe; Schneider, 1913-1967: II, 317. Hoop Scheffer, Jacob Gijsbert de. Inventaris der Archiefstukken berustende bij de Vereenigde Doopsgezinde Gemeente to Amsterdam. Amsterdam: Uitgegeven en ten geschenke aangeboden door den Kerkeraad dier Gemeente, 1883-1884: I, Nos. 961, 1162, 1180; II, Nos. 1926-41. Broer, A. L. and Nanne van der Zijpp. "Hindeloopen (Friesland, Netherlands)." Global Anabaptist Mennonite Encyclopedia Online. 1956. Web. 21 Apr 2019. http://gameo.org/index.php?title=Hindeloopen_(Friesland,_Netherlands)&oldid=125471. Broer, A. L. and Nanne van der Zijpp. (1956). Hindeloopen (Friesland, Netherlands). Global Anabaptist Mennonite Encyclopedia Online. Retrieved 21 April 2019, from http://gameo.org/index.php?title=Hindeloopen_(Friesland,_Netherlands)&oldid=125471. Adapted by permission of Herald Press, Harrisonburg, Virginia, from Mennonite Encyclopedia, Vol. 2, pp. 744-745. All rights reserved. This page was last modified on 27 September 2014, at 18:35.